"Father of global warming" won't say the super-dry weather proves climate change. Al Hartmann | The Salt Lake Tribune Gretchen Baker, ecologist for Great Basin National Park just over the Utah border in eastern Nevada, monitors the effects of the drought in Lehman Cave. 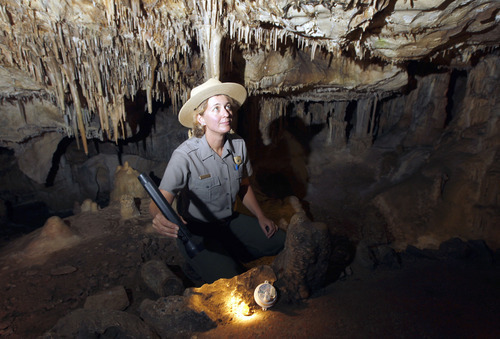 She checks a part of the Lehman Caves where water normally pools -- but now are dry. 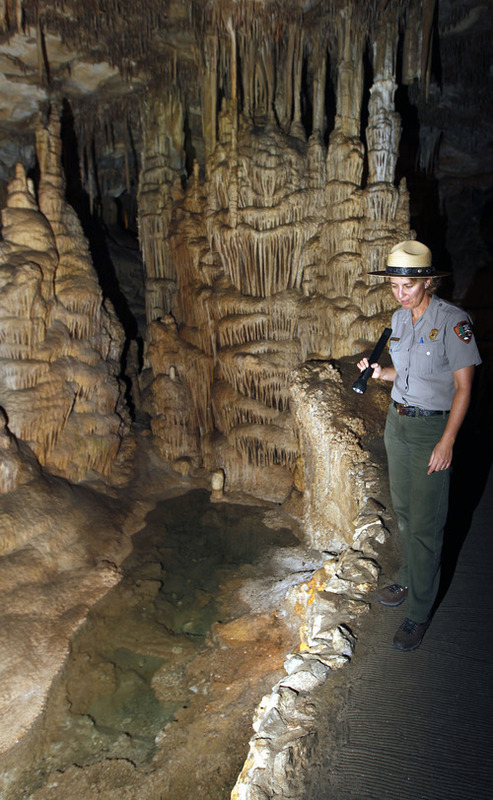 Al Hartmann | The Salt Lake Tribune Gretchen Baker, ecologist for Great Basin National Park, says the drought in western Utah and eastern Nevada is having its effect even inside the cool dank Lehman Caves. The pools known as the King's and Queen's bathtubs are dry. Western Utah has experienced the driest 12 months or record. Lehman Caves, Great Basin National Park • What's inside this gnarly rock maze hardly seems like it could mirror the world outside. For seemingly endless miles in every direction above and around the caves, drought is blighting the simmering hot desert. In contrast, life inside the mile-long cave network relies on steady 50-degree temperatures and dank air. But Gretchen Baker, an author and park ecologist, explains that inside and outside are intimately related and always have been. To see a sign of the record drought outside, she shows visitors two popular attractions inside, pools dubbed the King's and the Queen's bathtubs. "These generally have water in them many months of the year," she said. "They have been so dry, they haven't gotten any water in them this year at all." It turns out the caves are a time machine, reflecting not only what's happening on Mount Wheeler and in the Snake Valley outside but also centuries worth of global climate patterns. That's the crux of research on Lehman Caves stalagmites. One of the scientists involved in the work, Wally Smith Broecker, has been called "the father of global warming." A scientist at the Lamont-Doherty Earth Observatory and professor at Columbia University, he was the first to use what is now a hot-button term in his 1975 scientific paper, "Climate Change: Are we on the Brink of a Pronounced Global Warming?" Broecker would go on to use isotope dating and chemical tracers to show the interconnection between ocean currents and global climate  scientific findings that have become central to climate science. Now he and a team of colleagues are using similar tools to decode stalagmites  the calcite rock spires that jut up from the ground  from the Lehman Caves. This team analyzes the layering of minerals left by water drops for a century-by-century account of temperatures and precipitation that goes back thousands of years. The rock equivalent of reading tree rings, the technique is now considered one of the most precise ways to understand geologic change. "In a sense," said Broecker, "the caves track monsoons." He won't call last year's super-dry weather the result of climate change. Echoing other climate experts, he noted that anything short of a few decades is considered too brief a snapshot in time to make such a sweeping conclusion. Still, the drought outside Lehman Caves fits the patterns Broecker first noticed decades ago and scientists worldwide have verified over and over. Back in New York, where it has been an exceptionally warm, wet year, Broecker said the effects of shifting climate are playing out globally, not just in the record dryness along Utah's western edge. He pointed to unprecedented shrinking of ice in the Arctic and expanding summer slush in Greenland as examples. "We expect more and more of those things as time goes on," the scientist said. Looking to the winter, spring and the years beyond in western Utah, many worry what will happen if predictions come true and severe drought becomes the "new normal" in an already arid land. Broeker said their worry is warranted, and he wondered aloud if there is time enough for humans to deflect the trend. Baker, meanwhile, welcomes research from outside experts. She looks forward to untangling more mysteries with the help of the quirky plants, animals and minerals inside the park's caves. "During these dry periods," she said, "it makes us appreciate what we have even more."